I think they were Russian. The mother of the family walked in first. Her makeup was tasteful and subdued, as was her hair, which was done, but not overdone. She wore a tight t-shirt with a shiny graphic on the front. Good morning. How are you today? I asked when she came through the door. Not good, she said. We are lost. Her accent was thick. She was followed in by two teenage girls. Neither of them wore makeup, and their clothes were more suited to a day in the woods than to a day at the mall. Behind the girls came the husband/father. He was portly and had a headful of dark hair. He wore a casual shirt, but casual as in “casino,” not casual as in “forest.” He looked ten or fifteen years older than his wife, but perhaps it only seemed that way because she was better moisturized. Where are you trying to go? I asked the woman kindly. I was actively working on being kinder and more compassionate instead of the raging meanie I’d been for weeks. 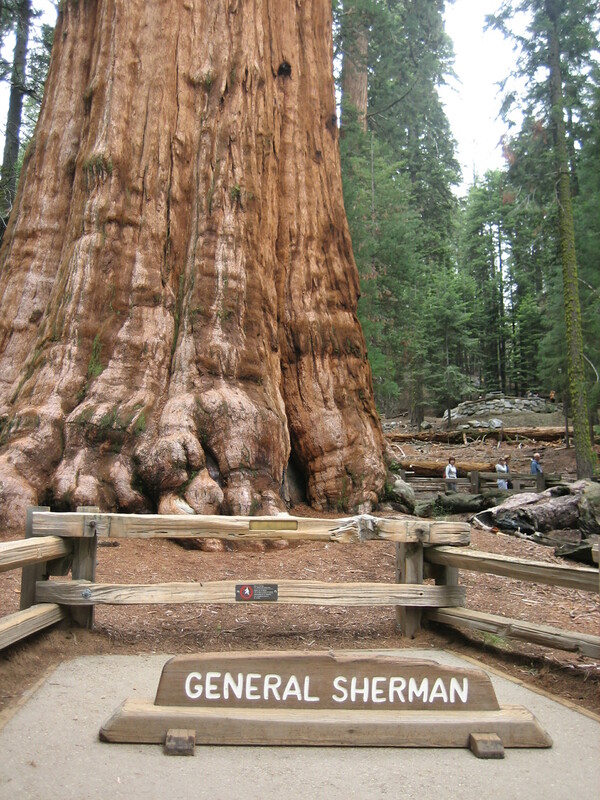 We are trying to see this tree…the General Sherman, the woman told me. Oh yeah. They were lost. This tree is famous. It is a very famous tree. 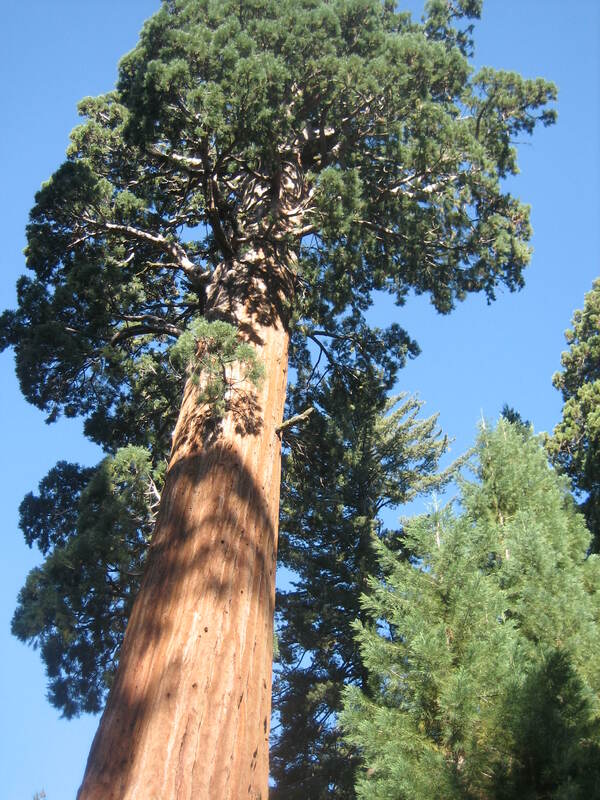 The General Sherman is in the Sequoia National Park, I began the speech I give when I’m asked about the location of the General Sherman. I spoke slowly and clearly, if a bit robotically. You are about 100 miles and 2½ to 3 hours from the Southern entrance to Sequoia National Park. Then I said more casually, You have to leave this mountain, go back to civilization, then go up their mountain. The woman looked glassy-eyed with shock. That was a fairly normal reaction when people found out how far they were from their intended destination. The first stage of wanting to see the General Sherman but discovering the distance still left to cover is shock. The woman spoke to the husband/father in a language I could not identify. I’ll say it was Russian, but that’s really only a guess. I told the woman how to get to the Park. I told her which way to turn to get on the appropriate highway and where to go from there to get to the highway that would take them to the Park. The woman dutifully translated to the husband/father. Now both of the adults looked at me with glassy eyes. I sighed and pulled out the tourist information booklet we kept behind the counter for the map which showed our location and the roads to take to the National Park. I pointed out their route on the map. The husband/father jabbed his chubby index finger at several different points on the map and spoke in an animated way at the woman. I couldn’t understand his words, but I think he’d moved on the anger state of realizing he was nowhere near the General Sherman. I noticed he kept jabbing his finger in a location quite south of where we were, but I had no idea what that was about. At one point the husband/father went outside (probably to take some deep breaths and try to avoid a vacation induced heart attack), but the woman remained standing at my counter. When I make reservation at hotel, it said it was only 40 minutes from National Park, she told me. With a little more questioning, I realized she’d made reservations online at a hotel more than an hour south of where we were standing. The hotel’s website, she said, claimed it was only 40 minutes from the National Park. I knew if that claim had indeed been made, the hotel’s website was telling a big lie, but I kept my mouth shut on that point. At least now I understood why the husband/father was jabbing his stubby finger so far south. The husband/father came back into the store. There was more finger jabbing at the map, more animated (on his part) and subdued (on her part) discussion in the language I didn’t understand. Then the woman looked up at me and asked, Are there any famous trees here? Oh! That was rich! Famous trees! I explained there was a trail featuring many giant sequoias across the street. They could pay $5 to park, then walk out on the trail and see lots of giant sequoias. She asked again about famous trees. That’s when I wanted to crash my head repeatedly on the counter in front of me. Seeing giant sequoias wasn’t enough for these people; they only cared about seeing trees that were famous. I dug around under the counter and came up with a flyer about the most famous tree in our area. This tree wasn’t the biggest or the tallest, but it was close. It had some credentials. The flyer had directions on it. I told the woman I couldn’t give her the flyer because it was my last one, but she could take a photo of it. She dutifully took a photo, but asked me if I could give her the address of the tree so she could put it into their car’s navigation system. Ma’am, I said, totally defeated, trees don’t really have addresses. There was more jabbing at the map by the husband/father, more finger tracing of the route, more animated discussion I couldn’t understand. When the fellow went out onto the porch again, I was finally able to make the woman understand she was in the National Forest and the General Sherman was in the National Park. This tree is not famous. Oh, she said slowly, there is difference between National Forest and National Park. I think it was dawning on her that the website for the hotel where she’d made reservations had said it was 4o minutes from the National Forest, not 40 minutes from the National Park. I wondered when (or if) she was going to confess her mistake to her husband. I reminded her again that her family could see giant sequoias right across the street, and she said they needed to think about it. The whole family, including the silent teenagers, went out onto the porch. I think they’d reached the grief stage of being so far away from the General Sherman. When the adults came back into the store, they had perhaps reached the acceptance stage of being a long way from the world’s largest tree. They were far from the General Sherman, and they’d either have to embark on a three hour journey to see it, or they would go south to their reserved hotel room with their collective tail between their collective legs. I think they’d decided to press on toward General Sherman because they tried to buy the map out of the tourist booklet. Of course I told them no. How would I help the next lost family (and I knew there would be others) if this family took away my only map? Once Jerico was secured in a kennel, The Man and I decided to take the Natural Entrance route down into the cave. We were both in fine health, able to walk a mile on “steep and narrow trails.” We thought it would be cool to follow “the traditional explorers’ route” in, rather than take an elevator down hundreds of feet into the earth. I bought our tickets while The Man looked in the gift shop. (There’s no reason for us both to stand in line, I told him.) Tickets for the self-guided tours of both the Natural Entrance route and the Big Room Route were $10 for adults without any special passes. Once I procured our tickets, we followed signs to the Natural Entrance. Before we started in, a very cheerful park ranger went over the rules visitor are expected to follow. Don’t touch any of the cave formations. No smoking or tobacco use. No eating. Drink only water. Don’t throw anything into cave pools. After the brief interaction with the ranger, we were on our way. 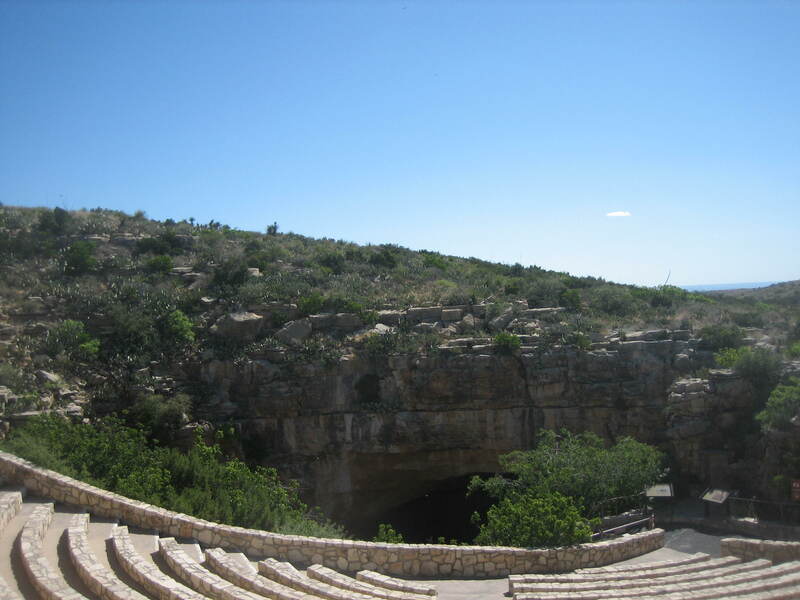 The Natural Entrance to Carlsbad Cavern is just past the Bat Flight Amphitheater. 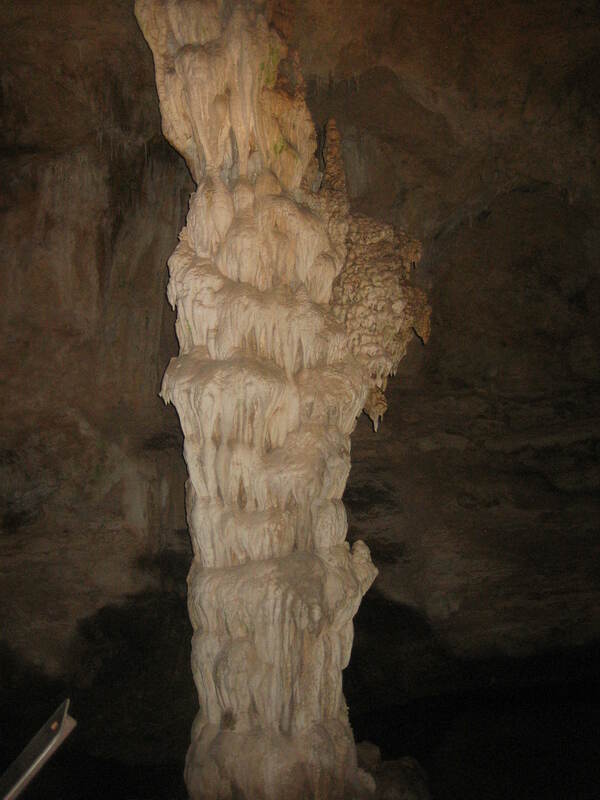 A column formation in Carlsbad Cavern. The cave wasn’t very crowded or noisy during our visit. Visitors are asked to keep their voices low to maintain a quiet atmosphere, but a large number of people whispering could be a noisy bunch. Even if a crowd was quiet, it might still be difficult to navigate around a lot of people. I prefer to visit attractions when I’m one of few visitors. To avoid crowds at any National Park or other popular place, I advise folks to visit before Memorial Day or after Labor Day, during the middle of the week, and as early in the morning as possible. 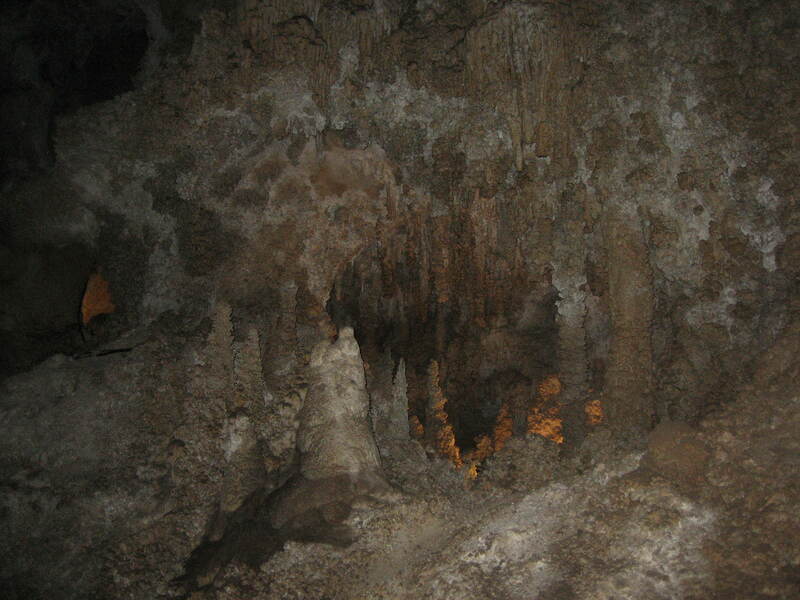 We visited Carlsbad Cavern on a Thursday in early May and started our exploration before 10am. While we didn’t have the place to ourselves, the cave was quiet, and everyone had plenty of elbow room. We hadn’t gotten very far into the Main Corridor when The Man said he felt very good, peaceful, even as if he had been to this place before. We wondered why we felt so calm in the cavern. Was it the cool temperature? The soft lighting? The quiet? The lack of electromagnetic radiation? We didn’t know, but we surely enjoyed our calm peacefulness. Both the Big Room route and the Natural Entrance route are lit with artificial light. The lighting is kept dim and is sort of yellow. The low light gives the cave a mysterious atmosphere. “The Natural Entrance route descends over 750 feet into the Earth…” and natural light can’t penetrate so deeply. Without artificial light, the dark zone of the cavern would be pitch black. It’s difficult to describe how it feels to be in the cavern. It’s both huge, like the tallest cathedral imaginable, and womblike. The air is cool and thick with moisture; it’s hard to remember the Chihuahuan Desert is a few hundred feet above. 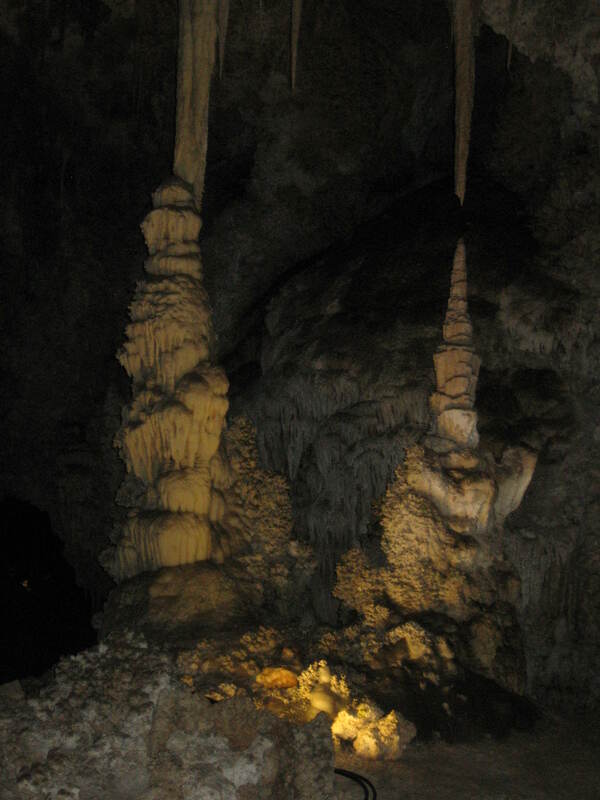 Carlsbad Cavern is its own unique world. The chambers are decorated with amazing, sometimes enormous rock formations that were created one drop of water at a time. Of course, the cavern is ancient. “The story of Carlsbad Cavern begins 250 million years ago with the creation of a 400-mile-long reef in an inland sea that covered this region.” How does a sea become a desert? I guess a lot can change in 250 million years. 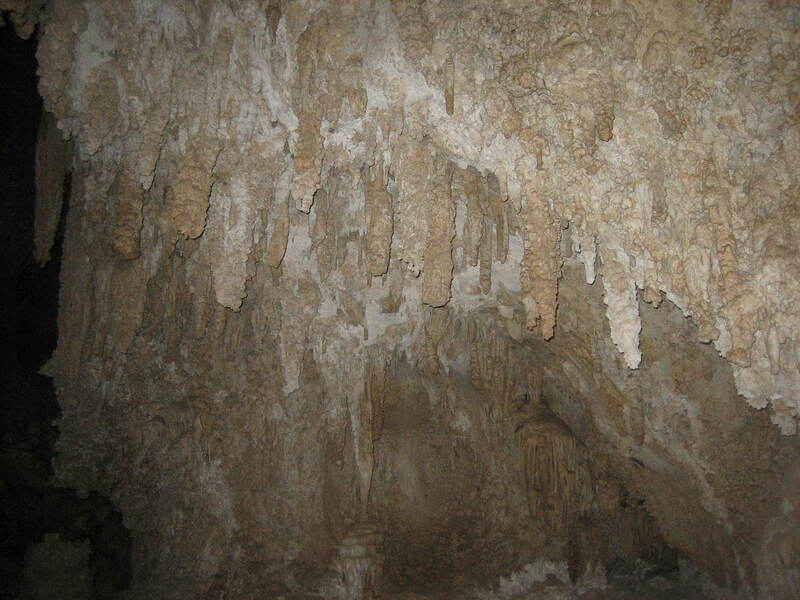 To learn more about how Carlsbad Cavern and its fantastic decorations formed, go to https://www.nps.gov/cave/learn/nature/geologicformations.htm. Soon after we passed Iceberg Rock, “a single 200,000-ton boulder that fell from the cave ceiling thousands of years ago,” we found ourselves near the elevator up and the beginning of the Big Room route. This is as far as I went the other time I was here, I told The Man. When we got here, my ex said he was too tired to go on, so we took the elevator up and left. The Man and I wanted to see every last bit of that cave, so we set out on the Big Room route. 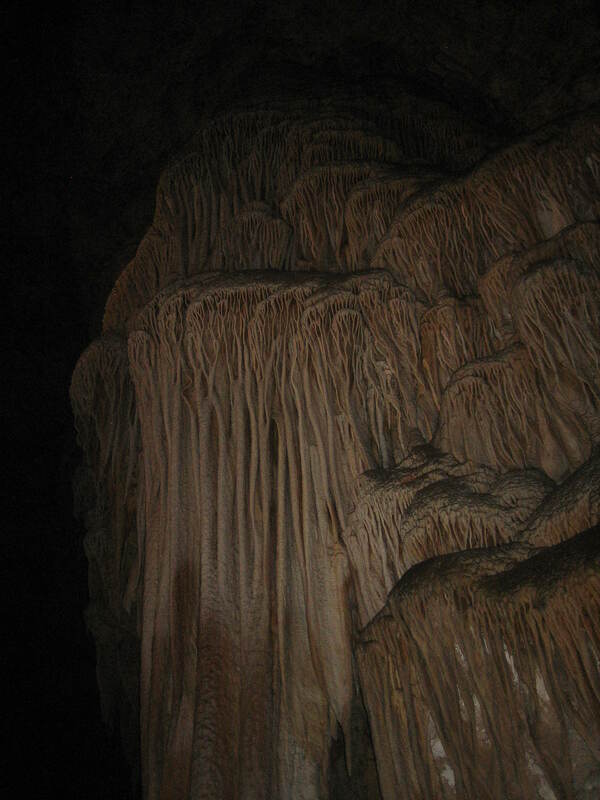 This is one of the formations I saw in the Big Room. The Big Room consists of “8.2 acres” and is “the largest room in the cave.” The paved trail is a mile long and goes in a loop around the perimeter of the Big Room. There’s a shortcut at about the halfway point for people who don’t have the time, energy, or inclination to walk the whole route. The Man and I were having nothing to do with a shortcut; we wanted to see it all! You missed all of this? The Man whispered in bewilderment as we walked through the Big Room. This is the best part! I had to agree. My ex’s foolishness had caused us both to miss the largest and most famous formations like Rock of Ages, Giant Dome, Twin Dome, and Crystal Spring Dome. The Man took my hand and said, I’m glad we got to see this for the first time together. StalacTites are on the Top. and a zoom, it wasn’t up to the task. I’m not a fan of flash photography, but the low light in the cave made it impossible to capture any image without using a flash. The Man got a few really nice photos using his phone, but even a nice photo is totally lacking. Like with so many natural wonders, the only way to begin to understand the majesty of Carlsbad Cavern is to actually visit it. The Man said seeing the cave had totally been worth the time, money, and effort. He was glad we had visited and thanked me for suggesting/insisting we go. He’s been to some beautiful places–the Oregon Coast and Moab, UT among them–but he said Carlsbad Cavern is one of the most amazing places he’s ever visited. 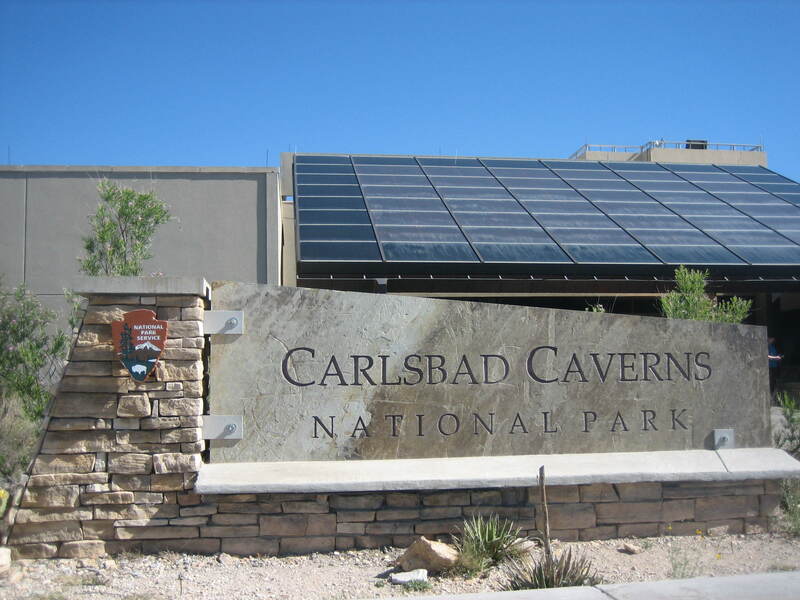 Carlsbad Cavern is open every day except Thanksgiving, Christmas, and New Year’s Day. Hours vary by season. For current information, contact the park at 575-785-2232 or see https://www.nps.gov/cave/planyourvisit/hours.htm. All information in quotation marks comes from the Carlsbad Caverns information sheet and map I was given when I bought our tickes. I took all of the (terribly disappointing) photos in this post.